Times change, fads change and relationships end. Sadly though, your tattoos won’t get that message. Luckily a tattoo doesn’t have to be forever anymore. Laser Tattoo Removal uses a very specialized, high power laser to destroy to imbedded intradermal ink and cause fading and disappearance of homemade and professional tattoos. The laser tattoo removal method is proven to remove your tattoo with the least possible scarring and recovery time compared to other methods. We use the Cynosure Q-Switched Medlite C6 Laser system to deliver the best results for all colors, all skin types, in the minimum number of visits. Most tattoos require anywhere from 3-12 sessions for complete removal. Factors for determining how many sessions required include whether the tattoo was homemade or professional, type of ink, multiple colors (green and yellow require the most treatment), and depth of ink. Contact us today for a laser tattoo removal consultation today. 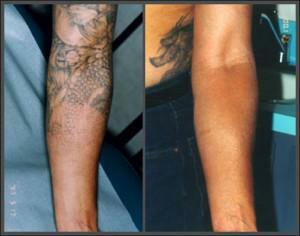 We can formulate the most appropriate treatment plan for your tattoos.